For $350 to $500, a professional home inspector will review the major, visible and accessible components of the home and provide a detailed written report rating each element. Deadline Newsroom - It's a good time for a home inspection. In today's tired housing market, a home inspection can wake up buyers to what "as is" really is and give them a negotiating edge that could lead to cash or repair concessions. For sellers, a home inspection serves as an anti-haggling tool and keeps the dickering down to a roar. An inspection is also for new homes, given new home defects aren't just incidental. It's also a good tool to use to assess a home's integrity after a natural disaster, including flooding, an earthquake, a wind or rain storm. Finally, a home inspection by home owners who aren't listing their home for sale can let them know every few years what maintenance or upgrades they need to perform. It's always a good time for a home inspection. For $350 to $500, a professional home inspector will review the major, visible and accessible components of the home and provide a detailed written report rating each element. Typically included are the heating system; central air conditioning system (climate permitting); interior plumbing and electrical systems; the roof, attic and visible insulation; walls, ceilings, floors, windows and doors; the foundation, basement and structural components. The inspection isn't intrusive and it may not include swimming pools, septic tanks, and other systems that require an inspection by a specialist. The objective report should include detailed information in a way that allows the customer to make informed decisions about the findings. The inspection also can be a learning opportunity for the buyer or seller who should attend the inspection. The inspection is an opportunity to see the inspector demonstrate systems and to get acquainted with necessary maintenance chores. The inspection also sees through the veil of misleading staging and other cover-ups and it can help buyers uncover building permit and code violations. Sellers can likewise use the inspection to determine what they need to do to put the home in competitive shape or price it fairly to sell as-is. While a home inspection, purchased by the buyer or seller or both, is more common than it's ever been, too many home buyers skip the process. That's especially true for new homes, but they also need a once over. There could be subcontractor issues missed by the contractor as well items missed by the local jurisdiction's harried building inspector. Studies have exposed newly built single family homes with construction problems related to the building envelope; framing and structural elements and in the plumbing and electrical systems. As homes age, given the life expectancy of certain systems, the home inspection grows in importance. Within 10 years, foundation settling could create drainage problems; by the age of 20, appliances are well outdated and the roof and wood components exposed the weather or moisture could need replacing; at 40 years the HVAC system will likely need replacement. Older historic or architecturally significant homes can develop structural problems and need restoration. Safety hazards that crop up in older homes include old sliding glass windows that are not tempered safety glass, missing smoke alarms and missing pressure relief valves on water heaters. Neglect plays a role too, as the lack of preventative maintenance takes it toll. Some homeowners take better care of their car than their biggest investment. 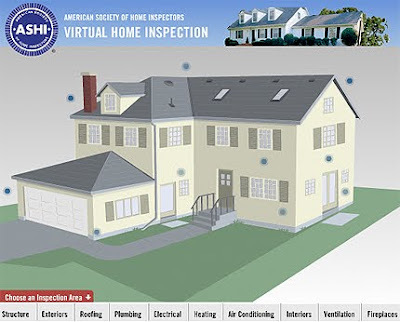 The American Society of Home Inspector's (ASHI) "Virtual Home Inspection Tour" online can give you a sense of what a professional inspector sees, what areas he or she can't see and won't inspect and what the inspector is likely to find and where.